As the summer temperatures rise and we all head for the cool breezes of the sea and to enjoy paddling through rock pools I hope you are able to see a plethora of seaweed fronds floating and decoratively draping over the rocks . Collecting and pressing seaweeds is a ‘littoral zone’ pass time of mine , a welcome diversion from recording and photographing plastic bottles, gun cartridges and rope. 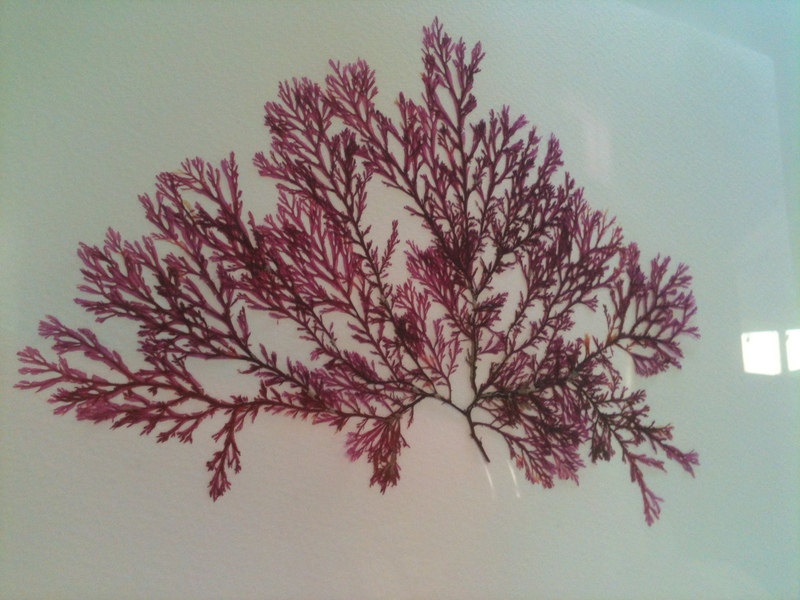 My love of seaweeds was fueled by attending a course at Edinburgh University last year, where I soon realised the vast number of varieties of seaweeds around our shores. The more you look the more shapes and colours you see attached to rocks shells, bridges and other seaweeds. 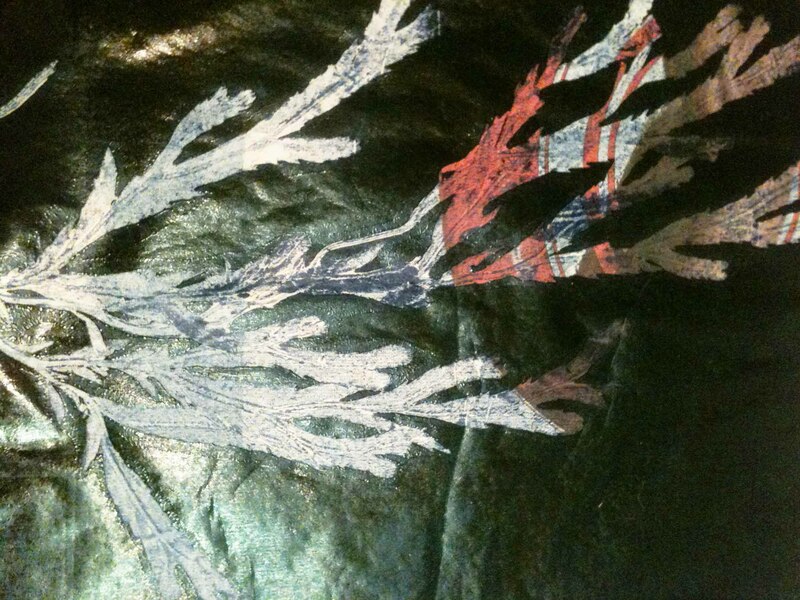 I started pressing seaweeds in order to take relief prints from them. 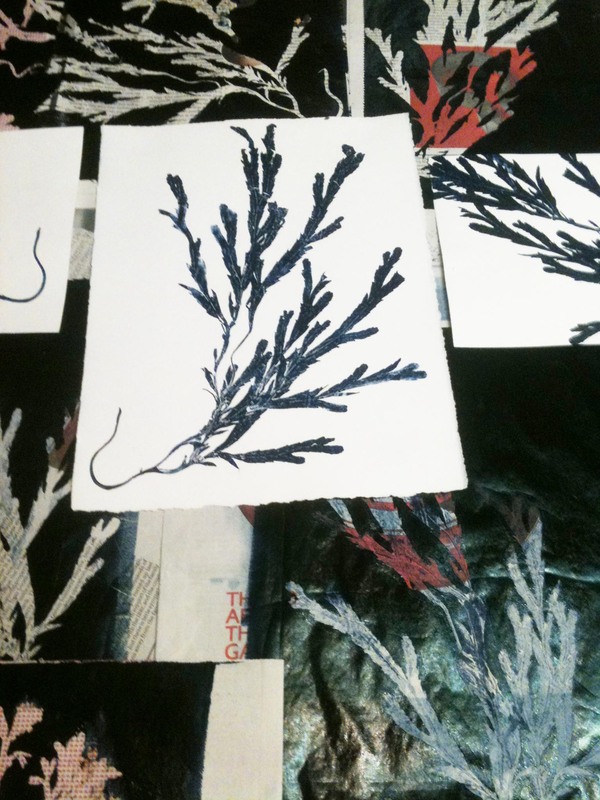 Their branching forms, being similar to the botanical specimens that I was used to printing, but the procedures for pressing seaweed samples is much more complicated. The method I tend to favour in order to get a natural floating impression is through immersing the sample in a tray of fresh water and putting a piece of card underneath it then lifting the card & sample out letting the water drain away. The sample is then placed under cloths, paper, a board and even pressure. Getting a good print is often a very delicate process taking much practice for each variety, the original sample choice is very important. 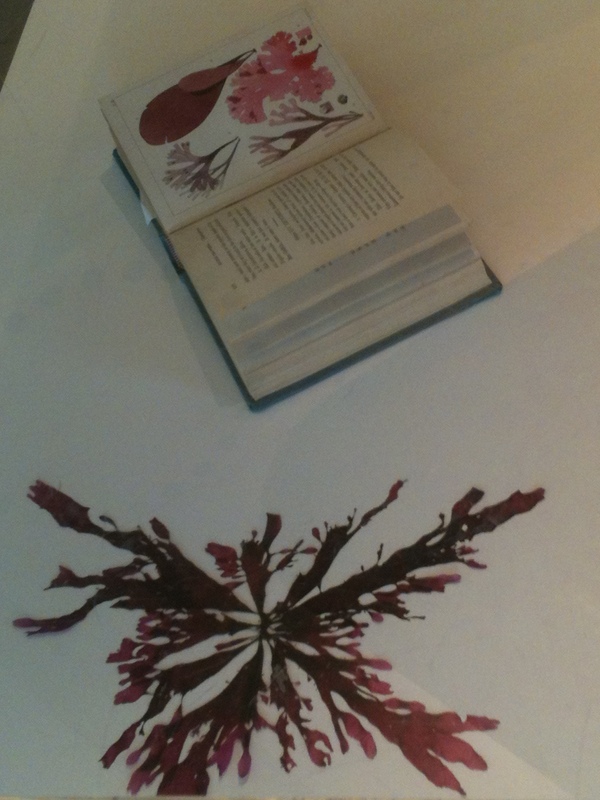 A few days ago I came across ‘The Rules for laying out and preserving seaweeds’ (as in the 1800’s) in a book displayed alongside exquisite pressed samples of red seaweeds collected from along the east coast of Scotland. 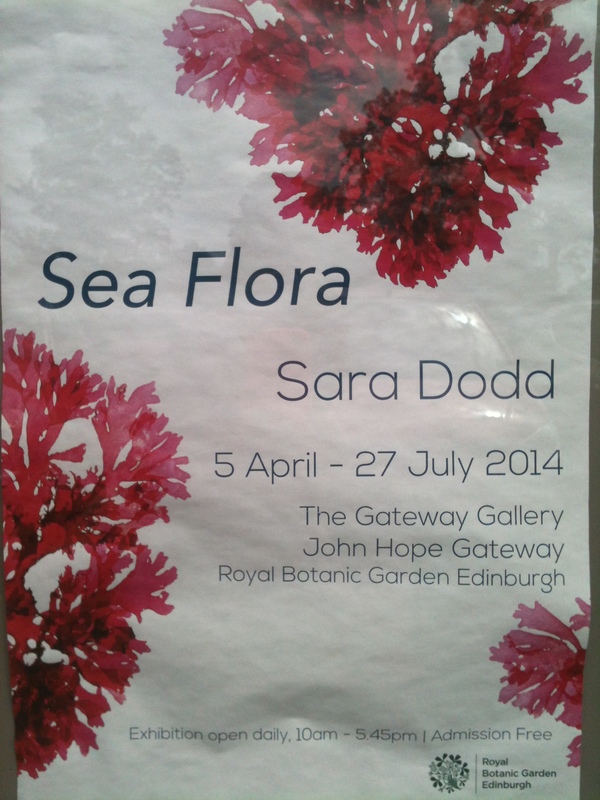 The seaweeds were pressed by artist Sara Dodd and displayed at the Royal Botanic Gardens Edinburgh as part of her wonderful Sea Flora exhibition in which she revisits the ‘Victorian tradition of collecting & preserving seaweeds’. Sara’s samples are delicately dramatic many looking like purple/crimson ink drawings displayed simply on while paper or between Perspex. 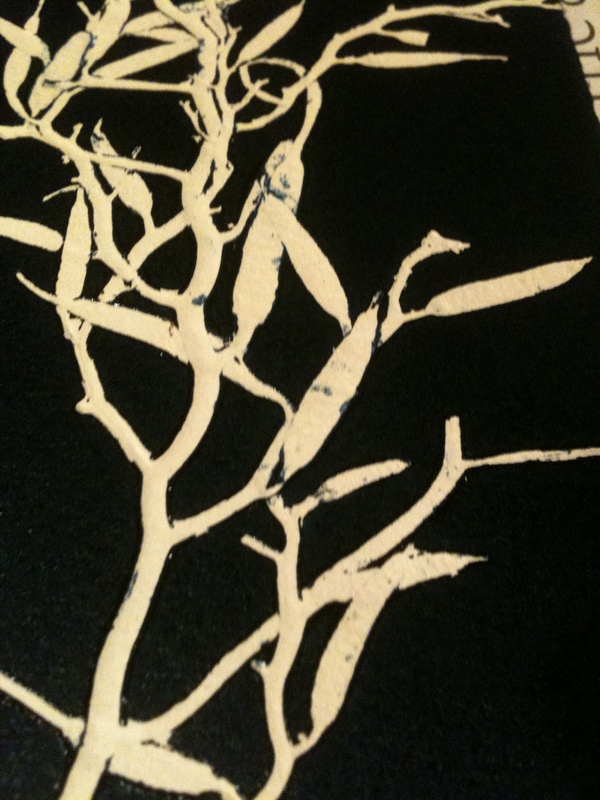 The exhibition runs for another few days until the 27th July only catch it if you can and visit her website www.tangandware.com which documents her work and observations on seaweeds particularly along the East Lothian shore lines. Enjoy.